Loyal readers: My solo trip to the UK, Czech Republic, and Germany was way back in October, and it’s taken me until now to go through the photos and write up the stories. Thanks for your patience. Admittedly, I wouldn’t have come to Cardiff if it weren’t for the Doctor Who Experience. That said, I wouldn’t have come all this way if there weren’t other things to see. Cardiff turned out to be a comfy tourist town. It wasn’t always so. For decades, the harbor was more badass, right down to its name: Tiger Bay (Bae Teigr in Welsh). It was a major gateway for transporting coal throughout the world, but after World War II, shipping dropped off and the area fell into disuse. 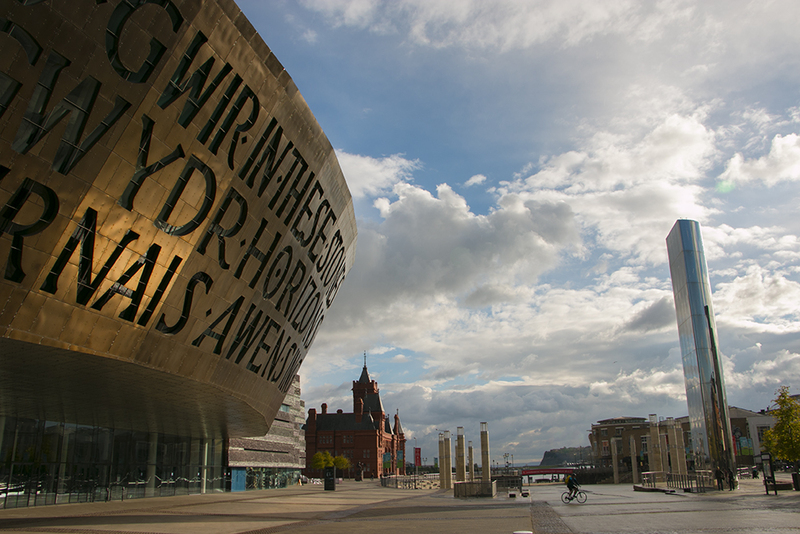 Beginning in the 1990s, the tiger was tamed, the bay renamed, and public and private money flowed into a revitalization project, creating the TV-ready sights that sci-fi fans now recognize from Torchwood. Cardiff Bay is home to the iconic (in the Doctor Who world) Wales Millennium Centre, which is an arts and theater complex. 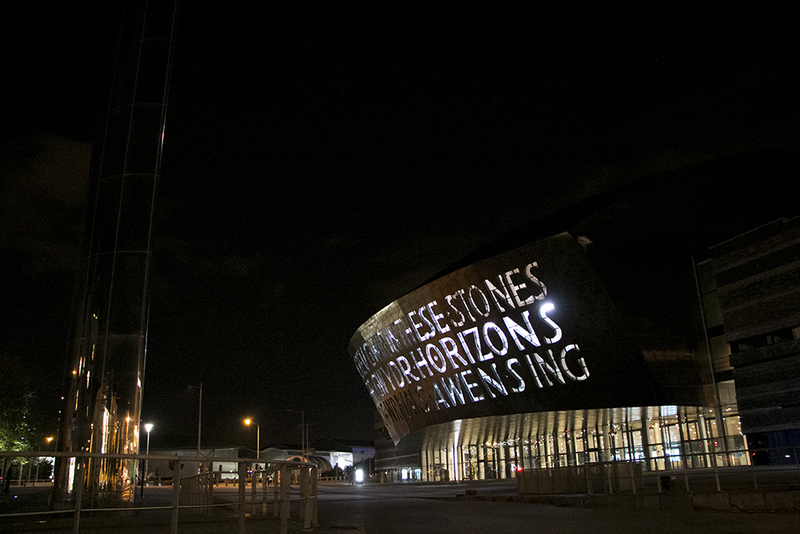 Just out the front door is Roald Dahl Plass, a plaza flanked by Welsh governmental buildings on one side and shops on the other. 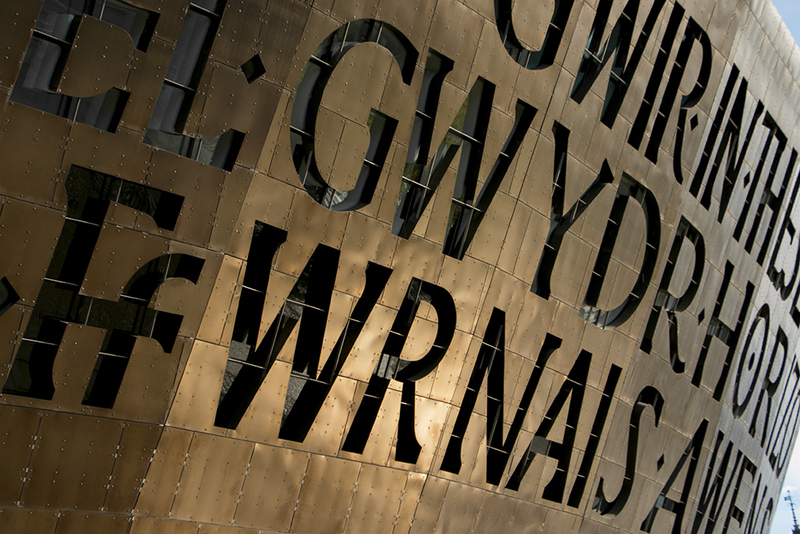 The “Charlie and the Chocolate Factory” author was born in Cardiff and christened at the nearby Norwegian Church (now an art gallery). During my October visit, the harbor was a bit of a ghost town. Tourist season had passed, and chilly temps and a brisk breeze meant that I shared the sights with only a few other brave souls. I think water is supposed to run down that silver monolith, but not this week. The Senate chamber from above. That chap at the desk is rehearsing his lines, preparing for a video shoot, so I felt right at home. The Norwegian Church, also known as Canolfan Gelfyddydau’r Eglwys Norwyaidd a Siop Goffi Norsk. I call it the Norwegian Church. Wander back to town (by bus), and you’ll find yourself in a compact grid of streets with the usual trappings: storefronts, coffee shops, a mall. 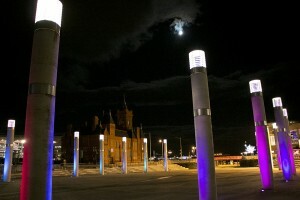 In the northwest corner of downtown stands Cardiff Castle, which dates back to the 11th Century and underwent numerous additions and changes in subsequent centuries. Clambering up the keep was pretty cool, offering an overview of the castle complex, with ultra-mod Millennium Stadium in the distance. 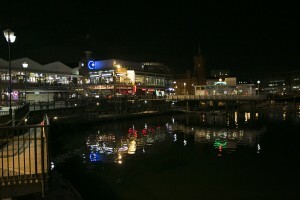 My home base in Cardiff was the River House hostel, just across the river from the stadium. During World War II air raids, almost two thousand people took shelter in tunnels built within the castle walls. Artifacts and a museum tell the tale. Skipping ahead to a modern conflict, this leaflet was dropped by the Brits in Iraq. Does this sort of thing really work? 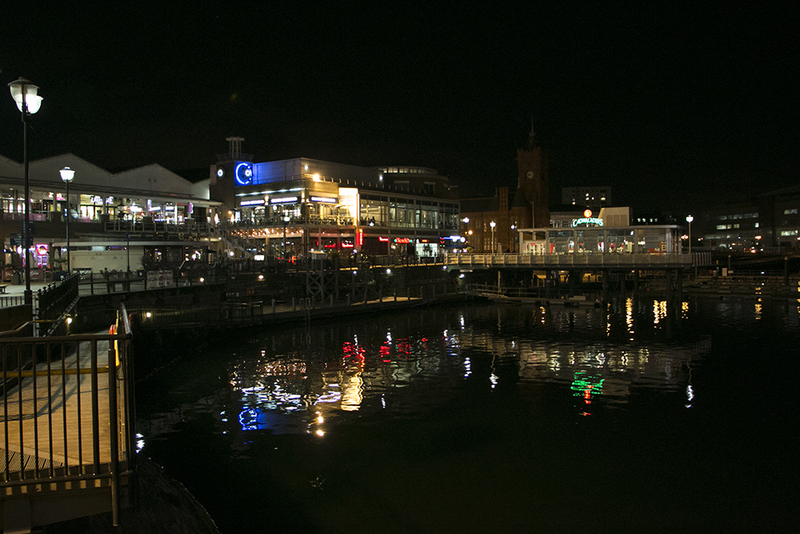 With just one night left in Cardiff, I set out to explore the city by moonlight and found myself drawn to the water once again. For me, all roads lead to Cardiff Bay. This entry was posted in Uncategorized on January 26, 2014 by Ken.